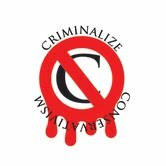 Criminalize Conservatism: Charter Schools = Goodbye, Middle Class! 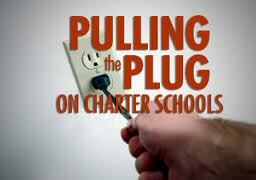 Charter Schools = Goodbye, Middle Class! "Quick - when you hear 'public housing,' what picture jumps into your mind? Or 'public hospital'? "All around us, our public institutions are disintegrating, and the most important public institution of all – our public education system – is the next to be ghettoized. "Despite several progressive victories this Election Day, there was one significant defeat in Georgia, as voters approved of Constitutional Amendment 1, which changes Georgia’s Constitution to give Republicans in that state the power to create charter schools as part of Georgia’s public education system. The result will be crucial taxpayer dollars being funneled away from free public schools and directed toward brand new, sometimes for-profit, privately-run charter schools. 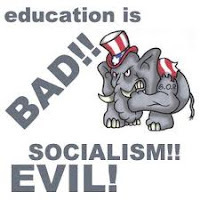 "Even though studies show (see below) that costly private schools don’t produce any better educational results than free public schools, for-profit schools have popped up all around the nation in recent years because of how valuable they are to corporate America. In fact, the historic Chicago Teachers Union strike earlier this year was largely in response to the city’s push to open up more charter schools to replace traditional public schools. "Education is a recession-proof industry that will always be in high demand. The corporate money-changers know if they can get their hands on this industry, 'reform' it to replace decently-paid teachers and faculty with McTeachers, and then get taxpayers to foot the bill, quarterly profits and lavish bonuses for CEOs can explode. Even in so-called "non-profit" charter schools, management can make big bucks. "And that’s exactly what Georgia’s Constitutional Amendment 1 accomplishes. Expect similar amendments to pop up in other state elections in the near future. "This is a major shot in the multigenerational war on public education part of our commons. "Ultimately, as more states pass charter school amendments like Georgia, and money is sucked out of public schools, then public schools will meet the same fate as the rest of the ghettoized public institutions in America. "Public education will be just like public housing, which most Americans think of as low-income, crime-ridden neighborhoods. Or it will be like public hospitals, which most Americans see as disease-ridden institutions filled with impoverished, sick people. Because, in both cases, these institutions principally serve the very poor, there’s little sympathy for Americans stuck in public housing or public hospitals. Little sympathy also translates into little funding, which perpetuates the cycle of poverty and the disintegration of our public institutions. "But up until the Reagan 'reforms,' public education had avoided this same ghettoizing fate. Historically, our public education system was a marvel for the rest of the world, producing generations of scientists, doctors, and engineers from all races and socio-economic classes. Whether you came from a wealthy family or a poor family, the American public education system didn’t discriminate. As much as possible, it was a multi-racial, multi-cultural, and multi-class public institution that produced great results. "But as state governments embrace for-profit charter schools, traditional public schools will be neglected and see their funding cut until eventually they, too, will suffer the same fate that ghettoized public housing and public hospitals. "This will mark the beginning of the end for not just public education in America, but also for the American middle class itself, which is shrinking faster and faster each day. 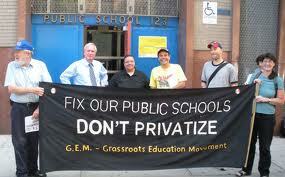 Public schools will be the new dumping ground for the poor and the working poor. And just as public housing provides the bare minimum for its inhabitants, and just as public hospitals provide the bare minimum for their patients, the new ghettoized public schools will provide a bare minimum of education for low-income students. "The public education system itself will no longer be America's great equalizer, churning out successful students from all cultural and socio-economic backgrounds. Instead, it will shackle the poor, keeping them from learning the essentials needed to find that great job for the 21st century and move up the economic ladder into the middle class – to achieve the American Dream. "America needs to 'just say no' to public funding of private schools." 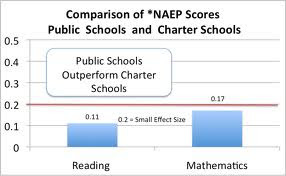 "Numerous national and state studies have shown that charters on average don’t get better results than regular public schools. A small percentage get high scores, more get very low scores, most are about average in terms of test scores. Why kill off a community’s public school to replace it with a privately managed school that is no better and possibly worse? 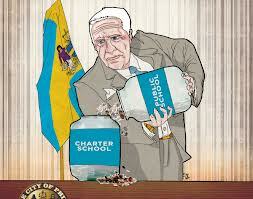 "Charter schools weaken the regular public schools. They take money away from neighborhood public schools and from the district budget. As charter schools open, regular public schools must cut teachers and close down programs to pay for them. "Many of the 'high-performing' charter schools succeed by skimming off the best students, even in poor districts. The more they draw away the best students, the worse it is for the regular public schools, who are left with the weakest students. "Many charter schools succeed by excluding or limiting the number of students they accept who have disabilities or who are English language learners. They are also free to push out low-scoring students and send them back to the local public school. This improves their results, but it leaves the regular public schools with disproportionate numbers of the most challenging students. "Many charter operators are for-profit, and the district winds up paying them tax revenue that should be invested in students. Many of the nonprofits pay exorbitant executive compensation that wouldn’t be acceptable in a regular public school district. "Charters fragment communities. Instead of everyone working together to support the children and schools of their communities, charters and regular public schools fight over resources and space. This is not good for education or for children. "Charters cannot help the large numbers of children who live in rural and semi-rural communities in Alabama. These communities barely manage to support their own local public school. Replacing a community institution with one that is managed by private operators with no local ties would do harm to the community. "Transferring control of public dollars to private hands is not reform. It is privatization. This strikes at the very heart of public education. It is a mirage. Alabama needs to do the right thing and support a sound public education system that benefits the children of the rising generation." 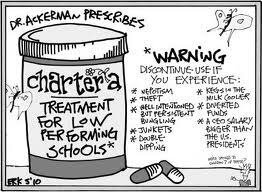 Like everything else Conservatives propose, the charter school concept must be shot down before it's too late. Conservatives will relentlessly pursue their goal of American Feudalism until their dying breaths, and only the criminalization of Conservatism will bring a halt to their incessant chipping away at democratic values and principles. "A woman knows the face of the man she loves as a sailor knows the open sea."